Denali, Greenland, Big Ben on Heard Island, the Himalayas, Sierra Nevada, Bugaboos, the Matterhorn, South America. 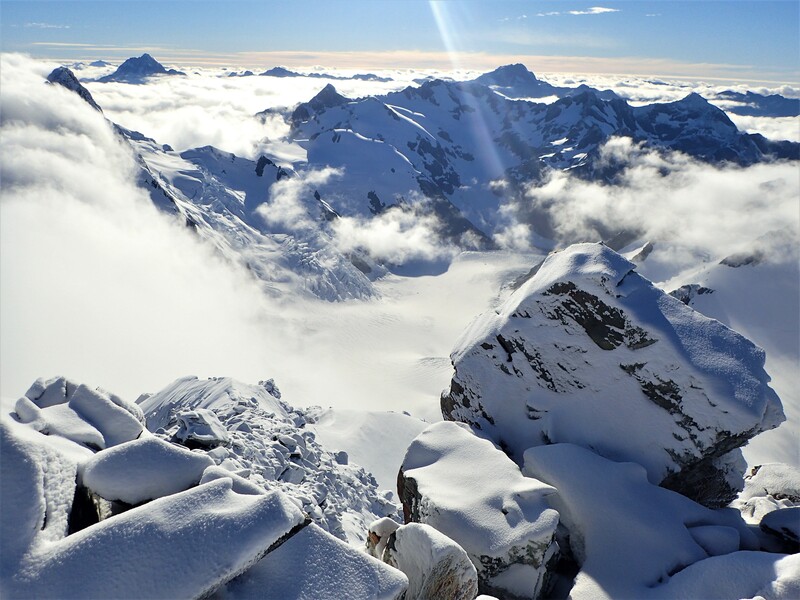 These were some of the mountains my friends and brothers had climbed on since doing their mountaineering courses to learn the ropes on snow and ice in New Zealand in the seventies. 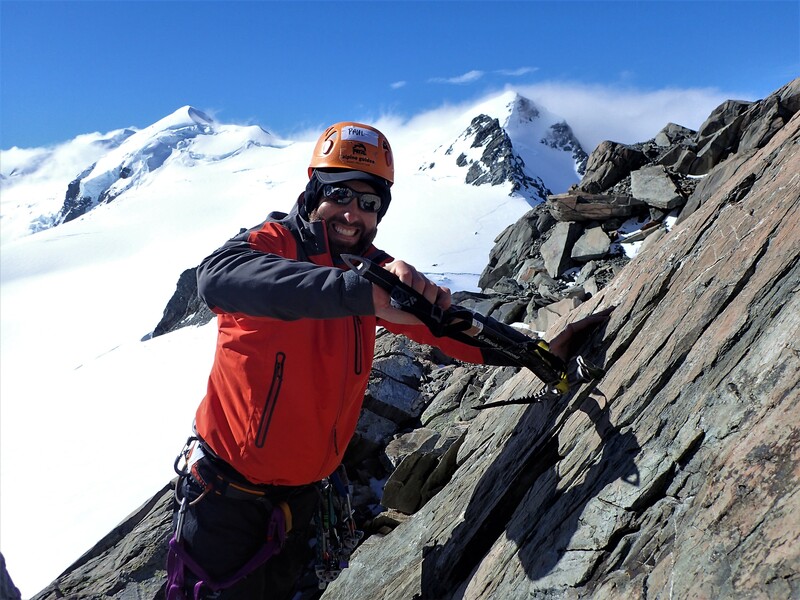 While they did several seasons in the Southern Alps honing skills and developing experience before venturing to other ranges I volunteered in Africa, got involved in family life and forged a career in outdoor education. My work took me away from home regularly – it would have been too hard to justify taking blocks of extra time out for New Zealand and longer expeditions – so I focussed on rockclimbing and extending my collection of books by Joe Simpson, Bonatti, Herzog, Dougal Haston, Jon Krakaur, Galen Rowel and a host of others. Then a chance hike around Grindelwald where I paid my respects at the bottom of the Eiger and saw the stunning Finsteraahorn in the distance surprised me with an intense emotional response and coincided with the opportunity to pursue the dream that had been shelved for so long. Mt. Cook beckoned above cloud on the flight over. On the drive beside Lake Pukaki next day the sun shone on the green water but clouds foreboded further up the valley. By the time I reached Unwin Hut rain was sheeting down. Waterfalls thundered off the hills behind the hut. The following day the clouds lifted and Cook’s summit caught the sunlight. Rainbows appeared over Nuns Veil across the valley. 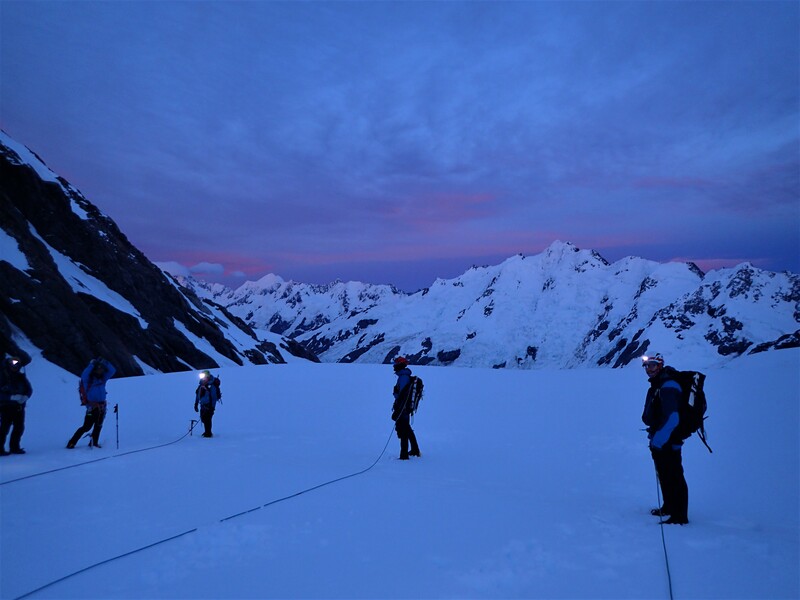 The course kicked off at the AG base in Mt Cook Village – intros, gear checks, a little theory and roping up for glacier travel. The group seemed switched on and quite skilled in rope sports. Back at Unwin the picture windows showed off the Malte Brun Range and Mt Wakefield. 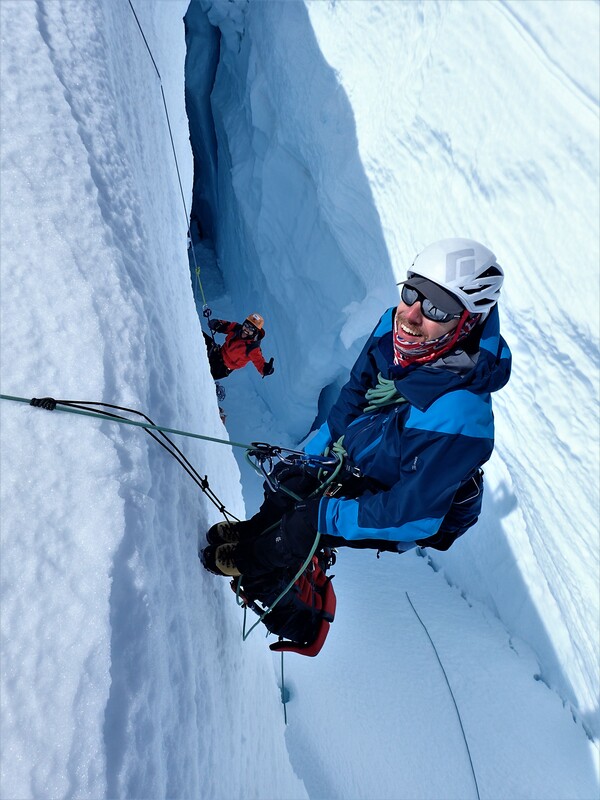 We practiced how to prussik out of crevasses and had an early weather check. A quick dash over to the airstrip, pack the chopper and we were away up the Tasman – mountains everywhere, the glacier, moraine walls, lakes. 10 minutes later we landed at Tasman Saddle about 500m from Kelman Hut. We carried gear and food up to the hut. Crampon technique, self arresting on back, front, headfirst, fun. Fine weather. Bill, the chief instructor, a total legend in mountaineering, gave us a detailed intro to hut life and safety procedures. We practised essential knots as the team settled in together. Paul was from Alice Springs and was doing the course to skill up so he could climb with his wife who was an accomplished mountaineer, Pat was the super keen ice climber with funky ice tools that he had already been practising with dry tooling in the rain at Kangaroo Point with Josh who seemed up for any adventure. Alice was contrasting her PhD on seagrass with snow and ice training and Nick from the USA had already been steep water ice climbing back home. Six of us with Tai, who was quietly capable and exuded skill and confidence, and Bill. A blasting wind arose in the late afternoon. The surrounding mountain landscape was wonderful – peaks of snow and rock, a plunging valley to the east, glaciers and ice falls. Mt DArchaic stood majestic on its own about 10 km away. Misty cloud flowed in from the sea to the west and covered the landscape. 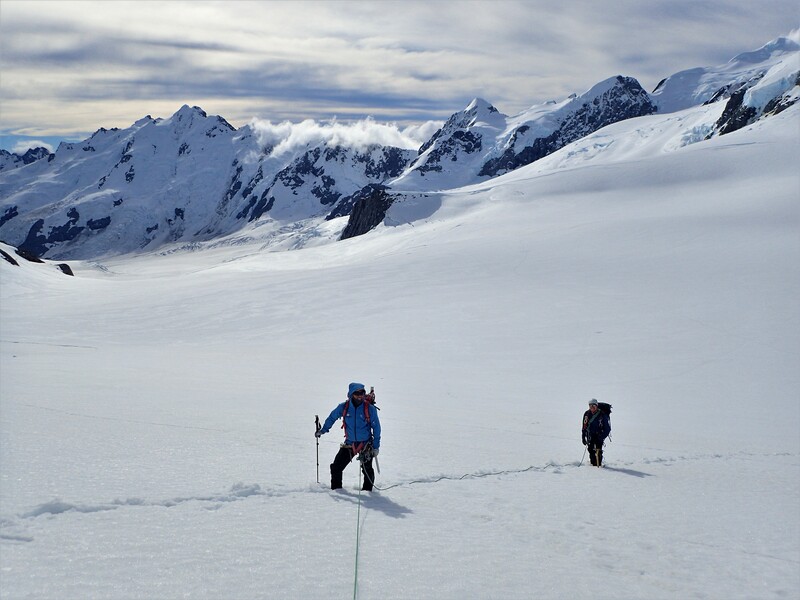 Two other climbers pitched up Mt Aylmer and descended through the afternoon. Terrible weather was forecast but conditions turned out OK. 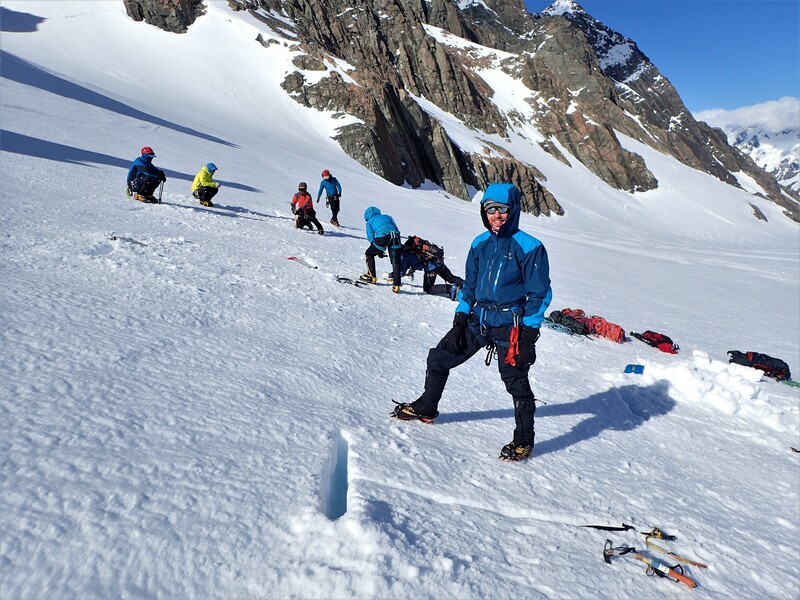 In the clear morning we did snow anchors on the upper flat of the glacier below the hut – top clip snow stakes, t slots with ice axe backups, mid clipped snow stakes buried in compacted snow, then snow bollards which tested under the weight of several “falling” climbers. In the afternoon it was misty and lightly snowing but the wind was light. We pitch climbed for six pitches up the snow slope and across a tricky schrund up to the rock buttresses of the peak above the hut. This was a great session of climbing and working together efficiently while practising anchor and belay setups. It felt terrific to be climbing in the atmospheric conditions. Later we practised using the ATC Guide in multiple use modes. Paul, who pulled out of going in My Kitchen Rules at the last minute, and I cooked ginger chicken and ginger tofu with honey soy vegetables and rice for dinner. Typically the food included lots of fresh ingredients, the fridge being a convenient covered hole in the snow/ice outside the hut. We cooked in pairs and pitched in with all the chores. The pattern of the hut days settled into a sort of routine which always started early and maximised every minute. This suited me, and seemingly all the others, as we had paid lots and were there to learn as much as possible. Overnight rain and snow continued in the morning. We did intensive skills inside. The hut is really well set up as an instructional space with weight bearing anchors fitted into the ceiling and upstairs landing and other anchors around all the walls. Equalising anchors, lowering using the ATC Guide, abseiling with prussiks above and below, joining ropes, throwing and deploying ropes, abseiling on thin ropes. I had done a lot of rope work prior to the course but still learnt heaps. The afternoon cleared and the wind dropped so we “went outside” and did rock anchors. The views between the clouds were spectacular. All of us were itching to go climbing. 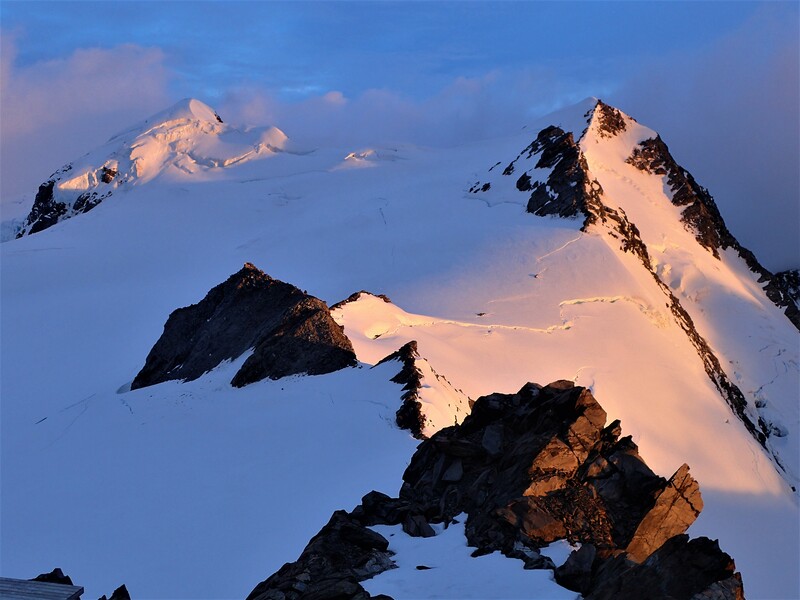 Every evening at 7.00pm there was a radio sched to check who was in each of the huts and to give hut users a detailed weather forecast and avalanche analysis. We took it in turns to use the radio and record the weather details. Later this info was used to formulate a Plan A and Plan B for the following day. 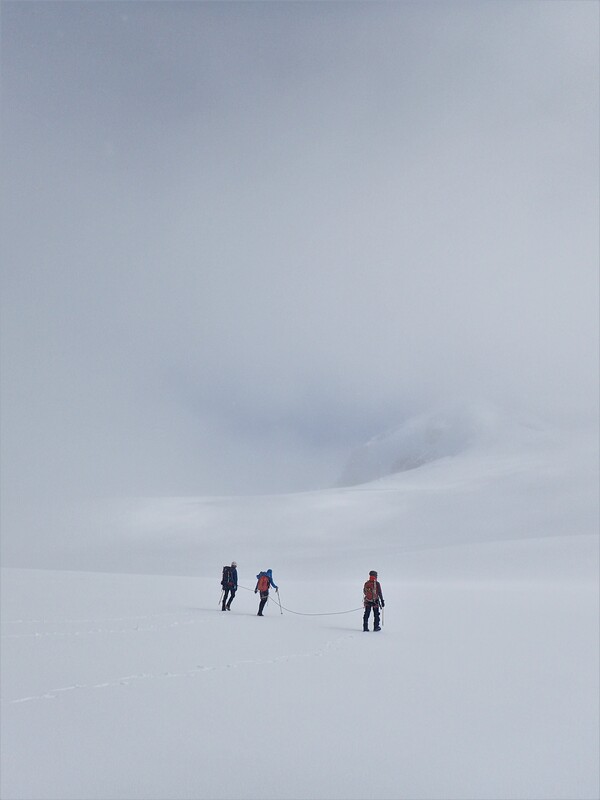 Being out in the mountains for so long (8 days in all) enabled us to witness several weather systems rolling through, to relate what we were seeing to the forecasts and to develop invaluable knowledge and experience of the conditions. 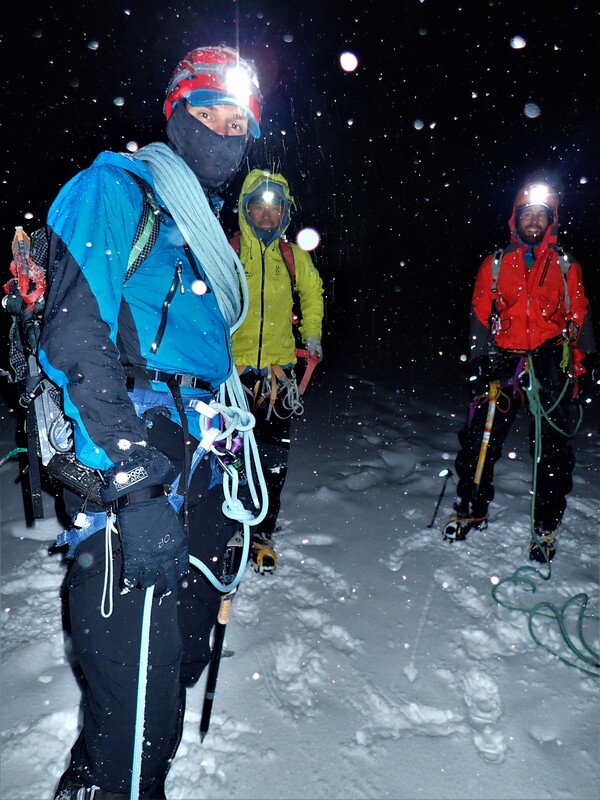 We learned fast that any activity in the mountains was dictated by the weather. The predictions for the day following the next were ghastly – severe gale up to 110 kmph, 240mls of rain in one day, freezing level 3,600 m (Kelman Hut is at 2500m). At 4.30 am we started hiking down to the ice fall in the Darwin Glacier. Under headlights Alice, the lightest climber, fell through a snow bridge but held on with her legs dangling in space (she was safely roped up) in a crevasse. 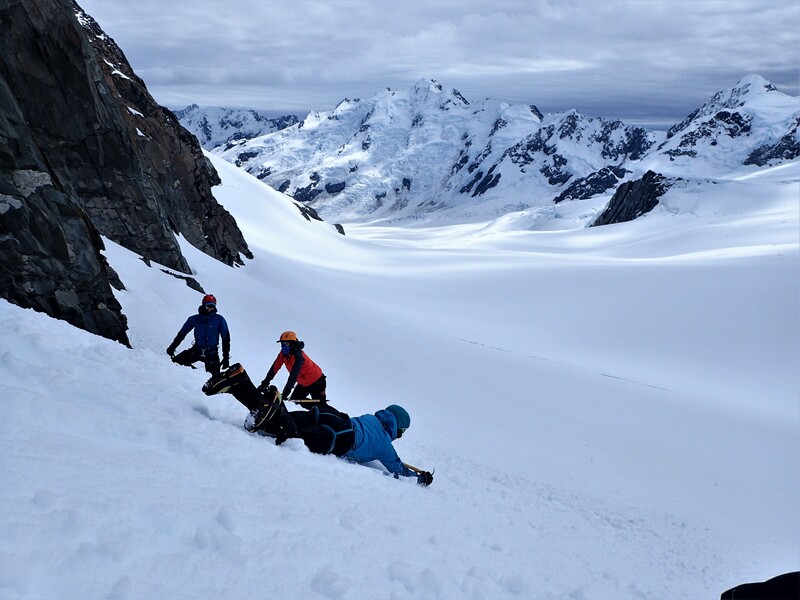 We spotted some other climbers high up on a beautiful snow and ice route on Mt Green. Ice climbing practice was done on the glacier ice, starting from low angle right through to vertical and gently overhanging. Pat’s super tools got a workout. The physicality of the steeper climbing felt great. 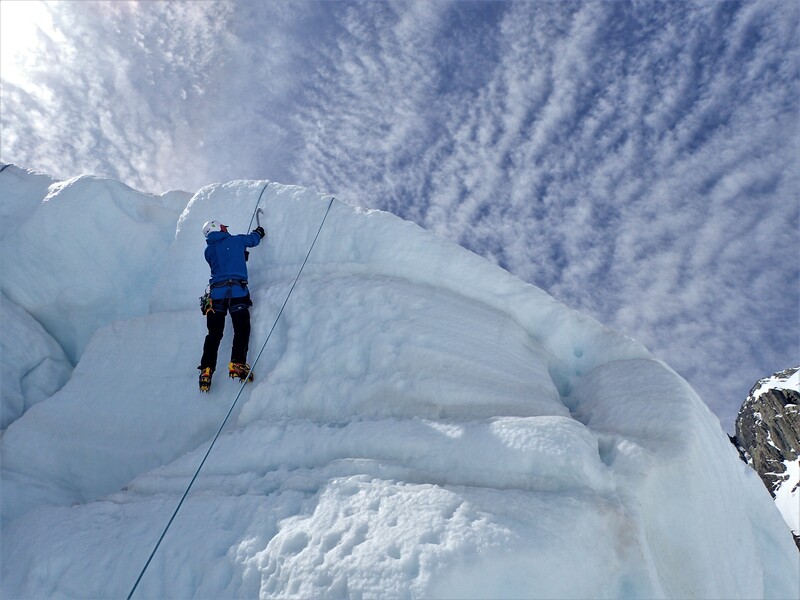 We placed ice screws and made v threads for abseiling, and were astonished at the strength of the v threads. 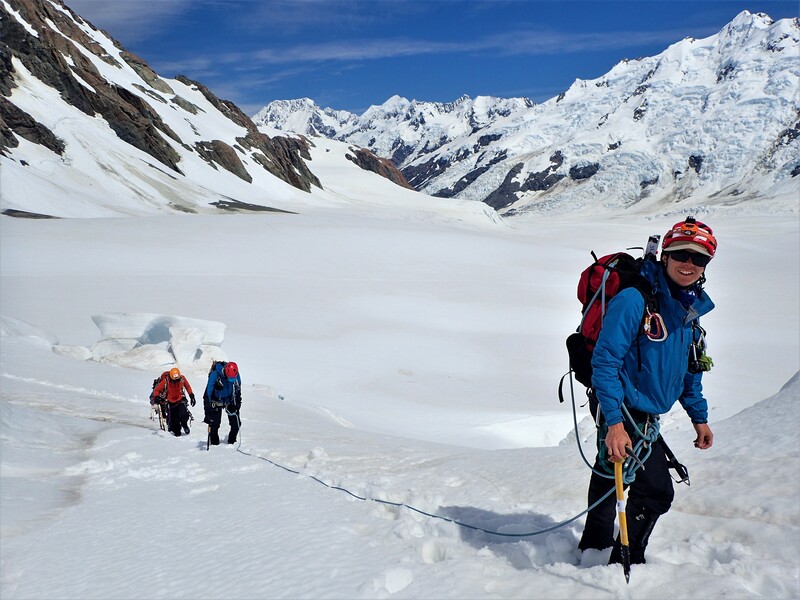 A circuitous route took us through the icefall and then we plodded back uphill in hot, intense sunshine. Huge weather remained forecast for the next day. HUGE rain. 80kmph wind at least. The hut shook and leaked a little. I wondered about the welfare of two groups of friends who were supposed to be out in the mountains on this day. It cemented in my psyche that you would have to be really well equipped and dug in to survive such conditions without a hut. The day was filled with interesting and useful rope skills and practice. Anchor systems, leading through efficiently. First aid kits. At a large crevasse we did practice rescues. 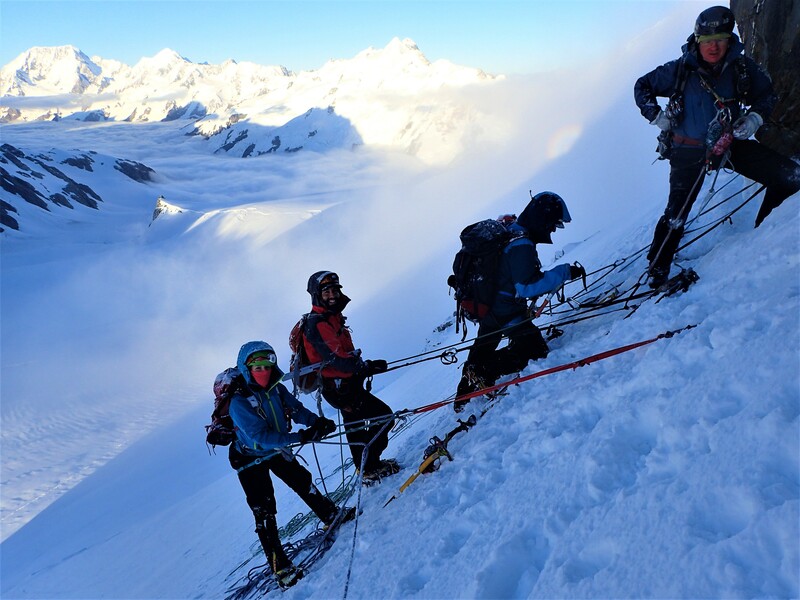 In a safe instructional context with Bill and Tai providing backup belays for the rescuers we “fell” in the crevasse while our buddies threw themselves onto the snow, dug their feet in and held the “falls” on their harnesses. The rescuer then made a t slot anchor, transferred the climber’s weight then the climber either prussiked out or was hauled out using an assisted haul or 6:1 system. For me it was powerful learning how quickly the rescuer can be dragged towards the crevasse while trying to arrest the fall. I would have this at the forefront of my mind when on the Bonar Glacier a week later. 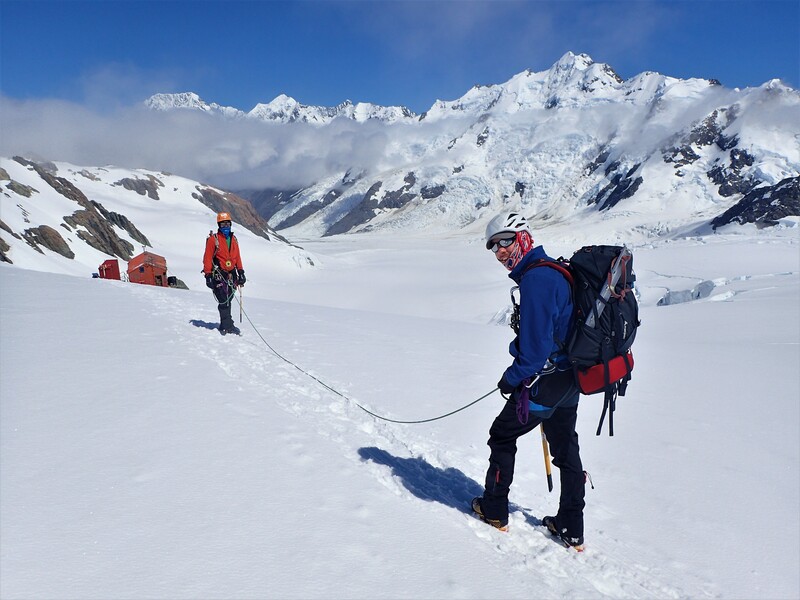 The later afternoon was taken up with theory on navigation and route finding and skills – kiwi coils, alpine clutch, locking and hauling systems using tibloc, bachman, microtraxion and ATC Guide methods. The weather forecast for the following day was good apart from a SE airflow. Sunset was a stunning display of pinks and orange against a black, jagged silhouette skyline. 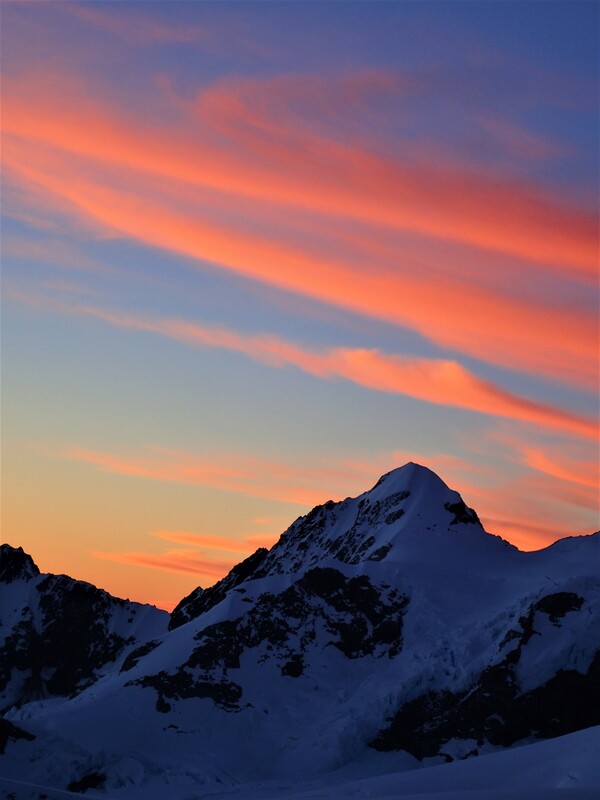 The evening star rose above the outline of Mt Cook and Tasman to the west. Grey, soft cloud edged up over the Tasman Glacier and enveloped Tasman Saddle hut further down the valley. Over a coffee Bill passed on lots of detailed info on access and climbs on Malte Brun, a mountain that was high on my list of interests. We prepped for a “summit day”. Lunch, clothes, backpack, ropes, gear. We would breakfast at 4.00 and depart by 5.00 am. A super excited feel enveloped the whole group. 3.45am. Snowing, heavy snow cover, very low visibility, light wind. 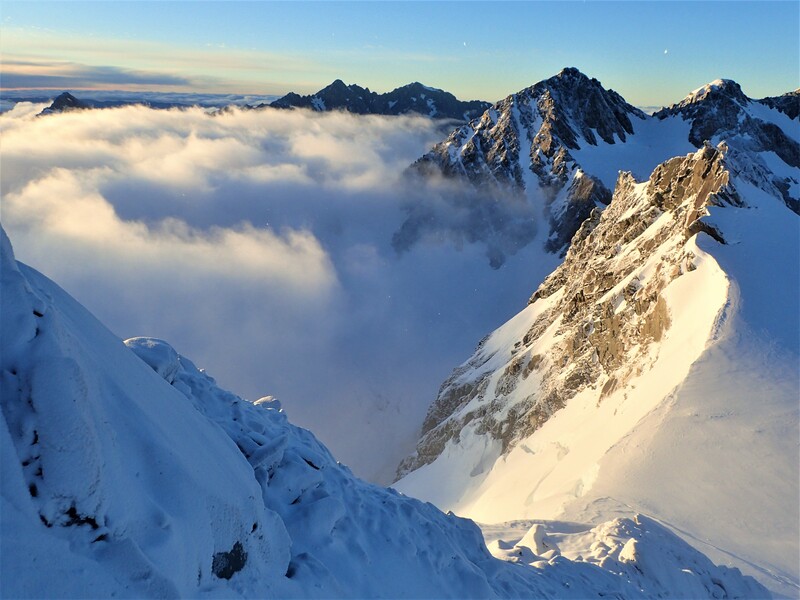 Learning – SE airflow often leads to cloud and often snow. Back to bed for a sleep in. Up at 6.00am. 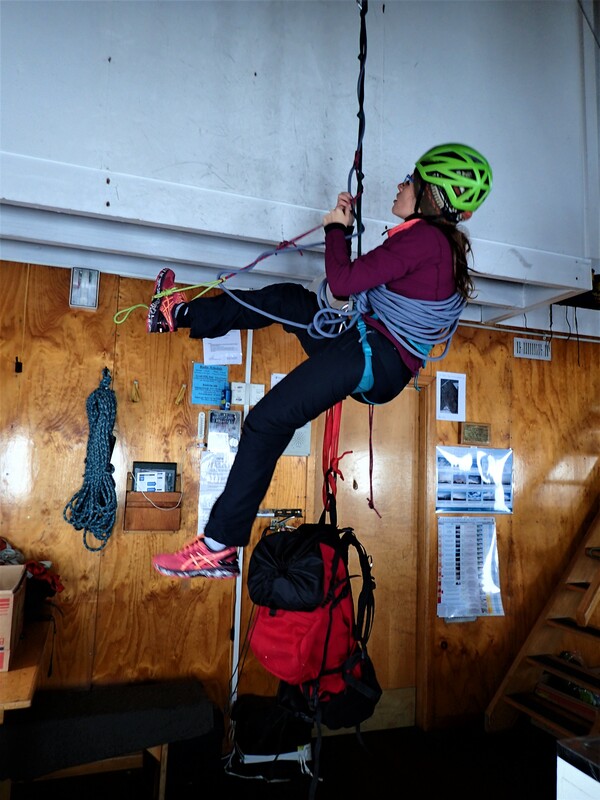 Inside – rope skills. Block leading, monster munter, knots with one hand. The limited vis was perfect for navigation exercises. 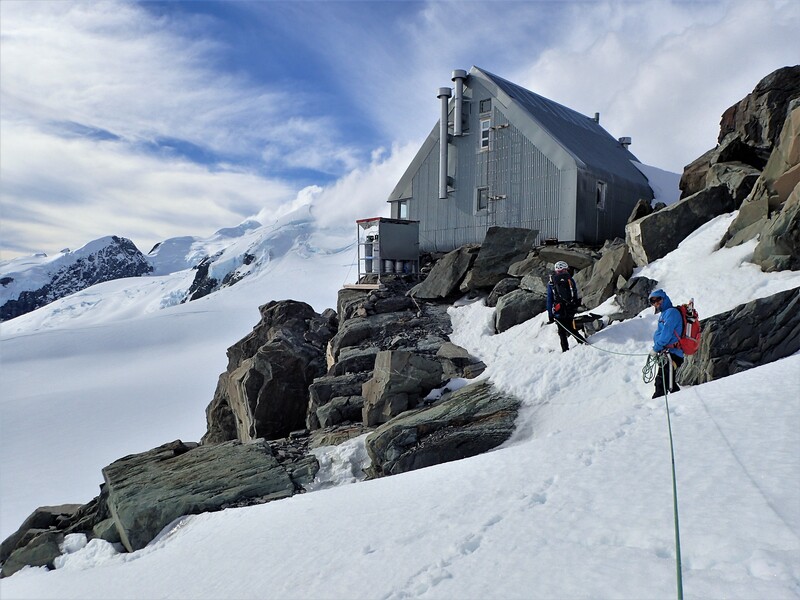 We trekked through thick mist to Tasman Saddle Hut using various methods to maintain course and estimate distance. On the return we trekked up to the start of our proposed climb for the following day on Mt Aylmer, setting a nice set of steps in the process. This process was invaluable on Aspiring for me a week later. Evening cloud engulfed the hut again. Oh dear. Maybe we wouldn’t get to summit anything on the course! Tai shared important background and gave a small group of us tips on climbing Mt Aspiring, topos, routes, access, descent etc over maps in the afternoon. 3.30am. Bill had already been up for a while and had the copious water boiling. His personal generosity with his time for the group throughout each day, I thought, had been instrumental in setting a philosophy for the whole course. He was forever doing myriad tasks to help individuals and the group progress. It seemed no wonder he had been a part of so many expeditions to the Himalayas- Everest, K2, Gasherbrum – he would be a key team player in these situations. It was snowing lightly and there was limited visibility but in parts of the sky the moon and some stars shone through. 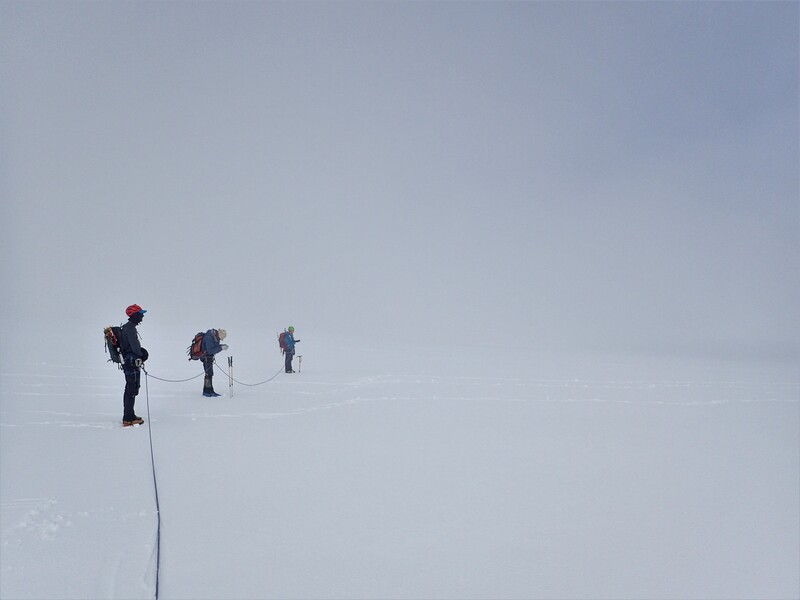 We left at 4.45am and followed the previous day’s footsteps through the murk to the base of the south face of Aylmer. In 3 pairs we did 4 pitches up the steepening ice on front points with axe and hammer. The ice was covered in powder snow. Stakes, ice screws and rock protection were used as runners and anchors. The atmosphere and aesthetics were stunning – we were snowed on, the mist swirled and slowly the sky lightened. Openings appeared in the cloud revealed a huge drop off the ridge. Sun struck Mt Cook. Peaks were islands in a sea of valley cloud. Pat led the pitches placing ice screw runners. 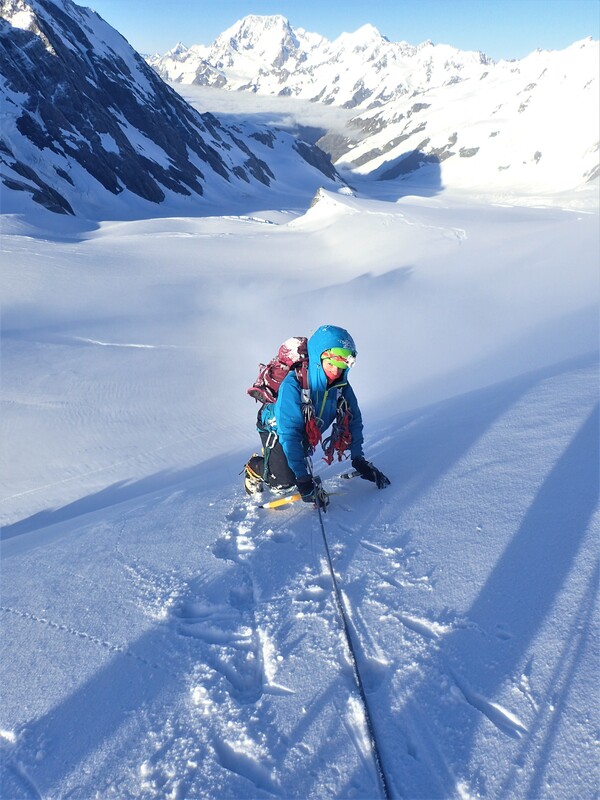 Climbing the upper pitches was exhilarating – I played with the minimum amount of effort necessary to swing the axe and crampons into the ice for adequate grip. With multiple groups climbing and anchored the feel was of a mini expedition. On the small summit the sun warmed us while below the 800m north face dropped off into the cloud. 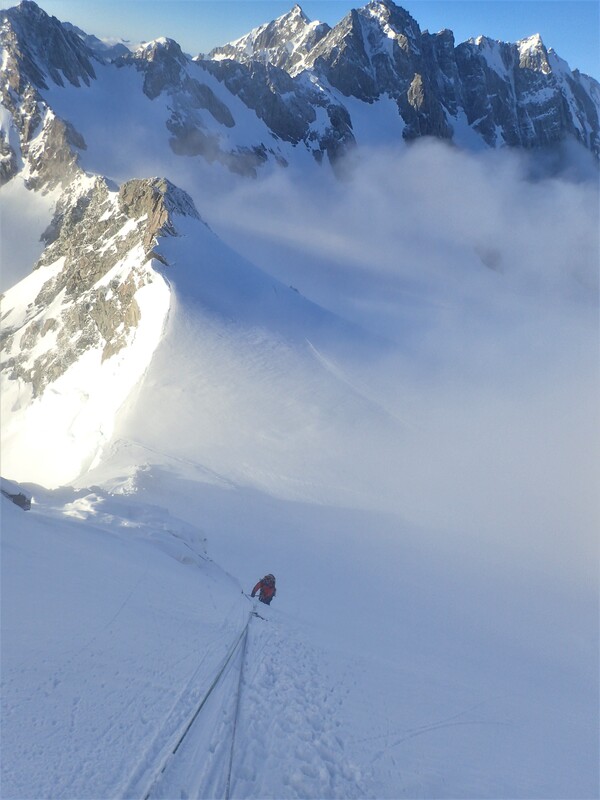 We simulclimbed and down pitched along a narrow ridge back to a col and then down to the base. Through all the bad weather and training of the week this was a wonderful culminating experience. Back at the hut at 10.30. A chopper took us back out to civilisation. Shower, clean clothes, dinner at the pub. Rain again so instead of rockclimbing on the Sebastopol Crag we made rescue stretchers. Tai gave us detailed input on mountains and routes that would be the most suitable next steps for us all. Bill responded in detail to Alice’s request for tips on high altitude climbing. I had loved living in the mountains for the 8 days. I had tuned in to the weather and begun to understand its ebbs and flows. I had learned much about mountaineering, been exposed to the wealth of knowledge and experience of the two fabulous guides. I felt confident and supremely motivated to undertake my own forays into these mountains, to Europe, America and maybe beyond. 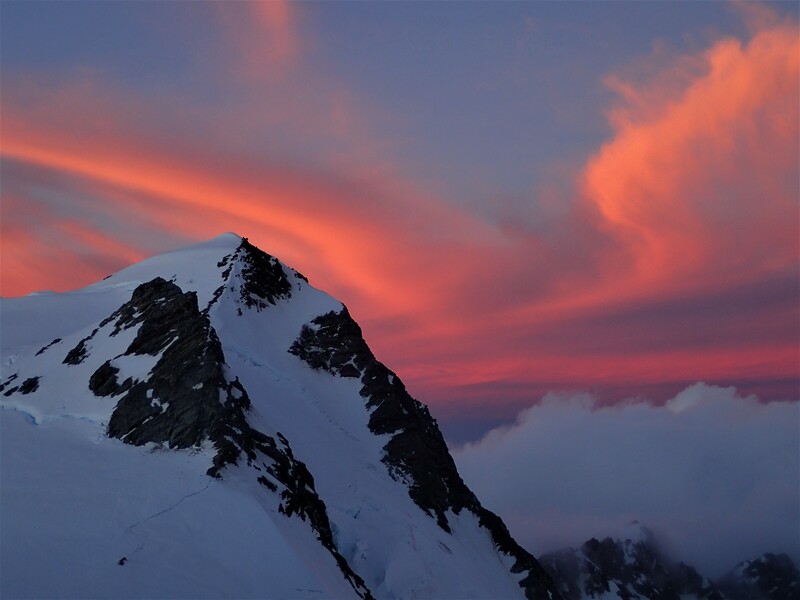 I had a list of 100+ peaks to climb in New Zealand with a growing log of info. Perhaps if I tried to do about 4 per year I could have enough for the next 25 years. 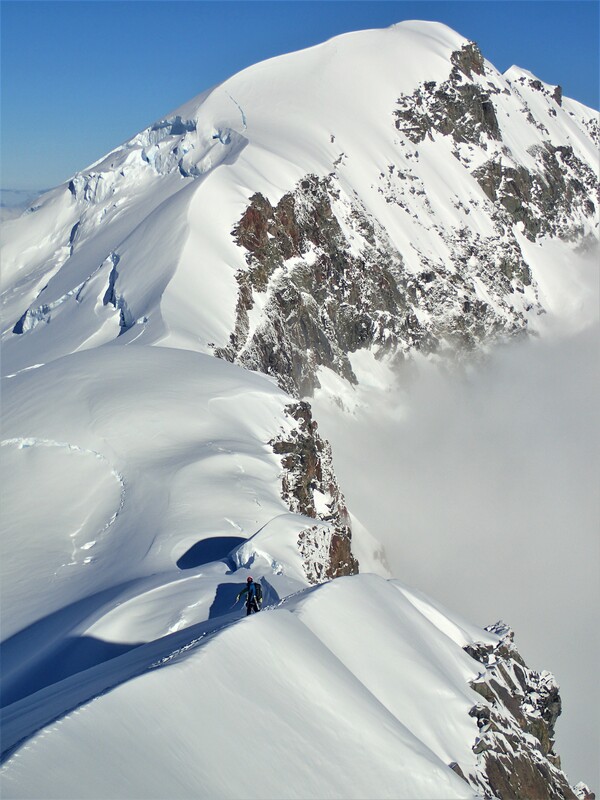 If I could scramble up Kitchener from Mueller hut then meet up with a mate in a few days time and be lucky enough to score some clear weather to climb Aspiring that would make 4 so far, 40 years later than my mates and brothers, but what matters that! It’s the here and now that counts. 2+ From Top Forks Hut long day, bivvy near base? Ball Pass Route From Mt Cook Village, over Pass to Ball Hut, 8-10hrs,then down to Blue Lakes. From Douglas Flat Hut, high bivvy, descent? solo from village via Sebastapol?